Here, 5 terrific drinks that illustrate exactly how you should be drinking summer tomatoes. This sweet-and-savory nonalcoholic drink features tomato juice, orange juice hot sauce, Worcestershire sauce and a dash of salty olive brine. Purists will insist that the subtleties of a fine single malt Scotch are lost in a mixed drink, but this cocktail proves otherwise. It's rich, smooth and strangely exotic. 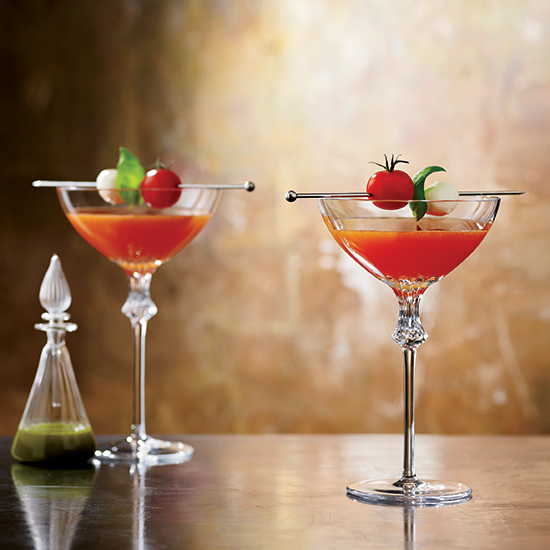 This daiquiri evokes the flavors of a caprese salad (tomato, basil and fresh mozzarella). It's spiked with white rum and garnished with a mini caprese on a skewer. This tangy Bloody is surprising and fun as yellow (“blondie”) tomatoes are substituted for the usual red. This deconstructed Bloody Mary can be made year-round with bottled tomato juice, but fresh, ripe tomatoes in the summer are optimal. Instead of the usual ice cubes, it calls for colorful cubes flavored with celery, Worcestershire and Fresno chiles.